Welcome back to Pondering Playtime, my fortnightly series where I share a favourite picture book and a craft or play activity to go with it. 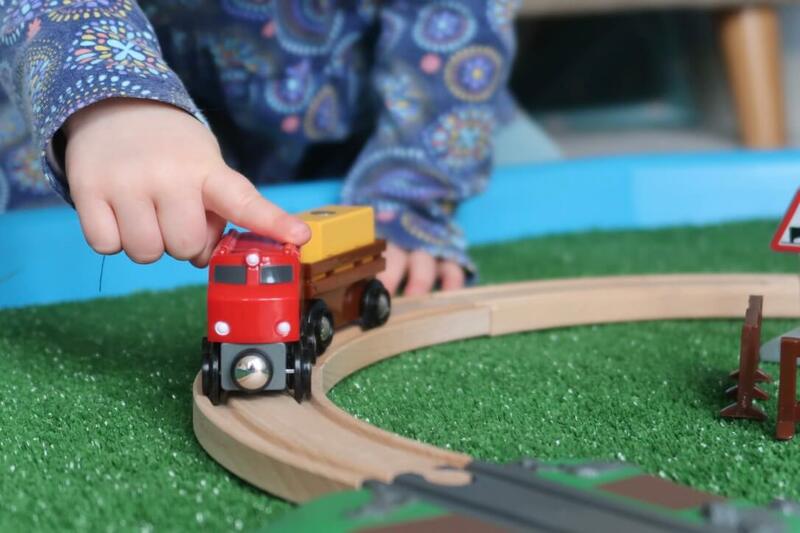 This week, I’ve chosen Thomas and the Spring Surprise by Rev. 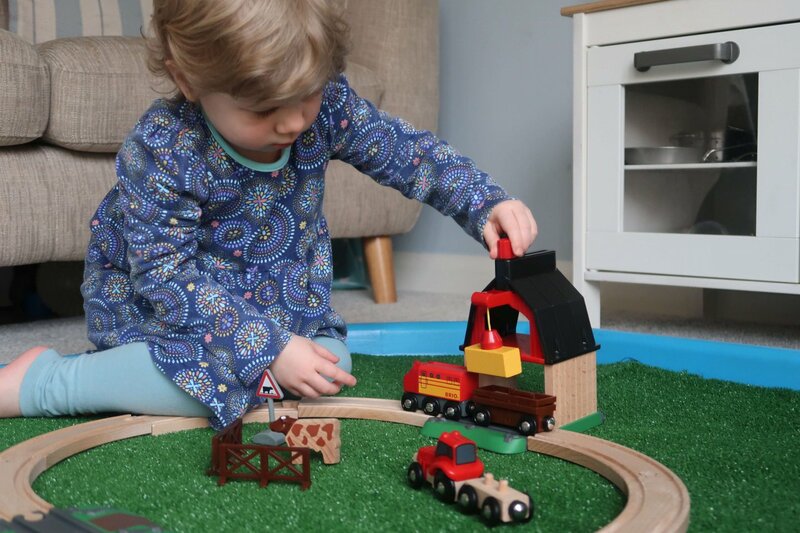 W Awdry, as I wanted to create a tuff spot using the BRIO Farm Railway Set that we were recently sent to review. 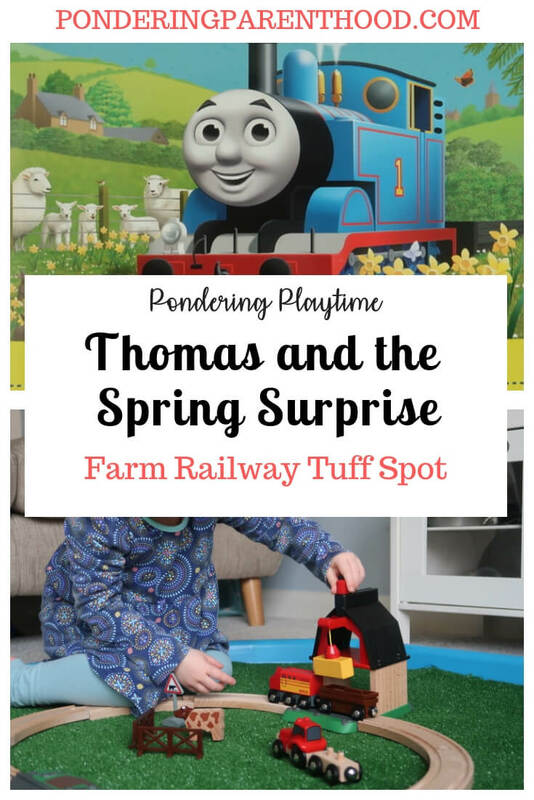 Thomas and the Spring Surprise – What’s the Story? 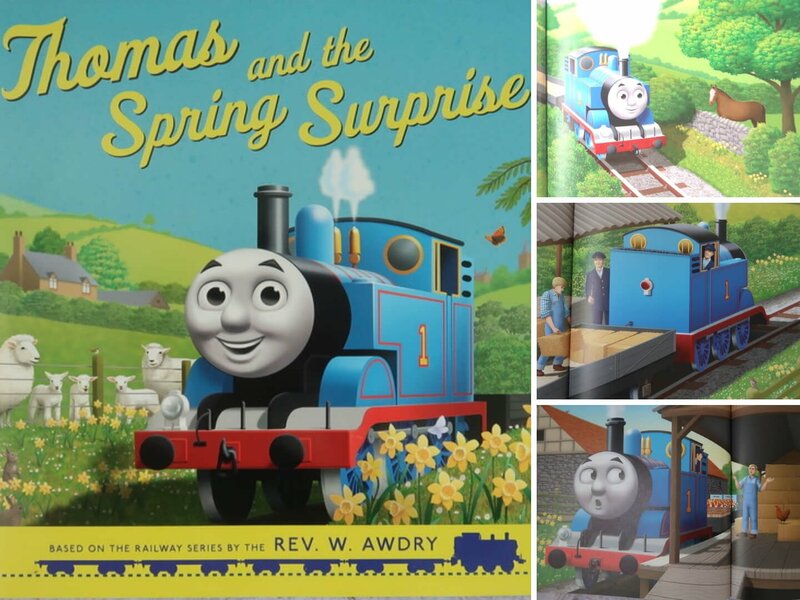 Thomas and the Spring Surprise is a book in the newly revamped Thomas the Tank Engine series. 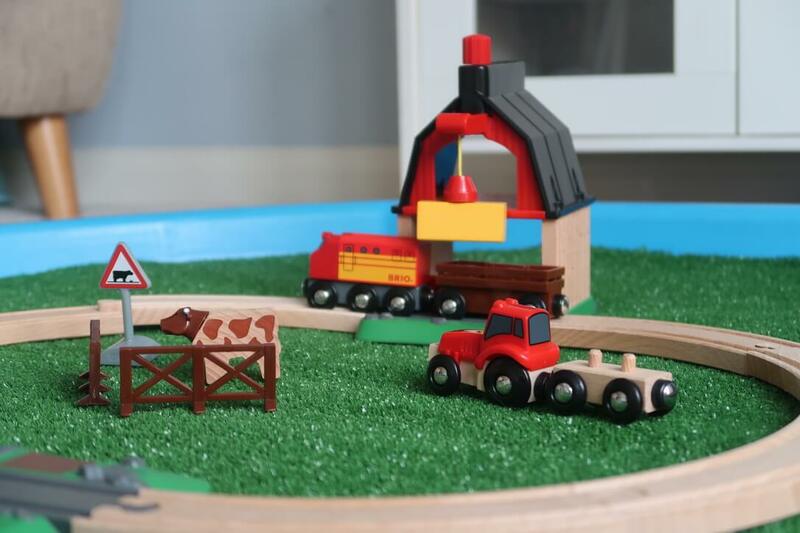 This story follows Thomas as he’s asked by the farmer to collect bales of straw for the lambs that are about to be born. Of course, Thomas is so keen to make the lambs happy, that he collects lots of other things that he thinks they’d like, leaving no space in his carriage for the straw! Will Thomas be able to collect the straw in time? 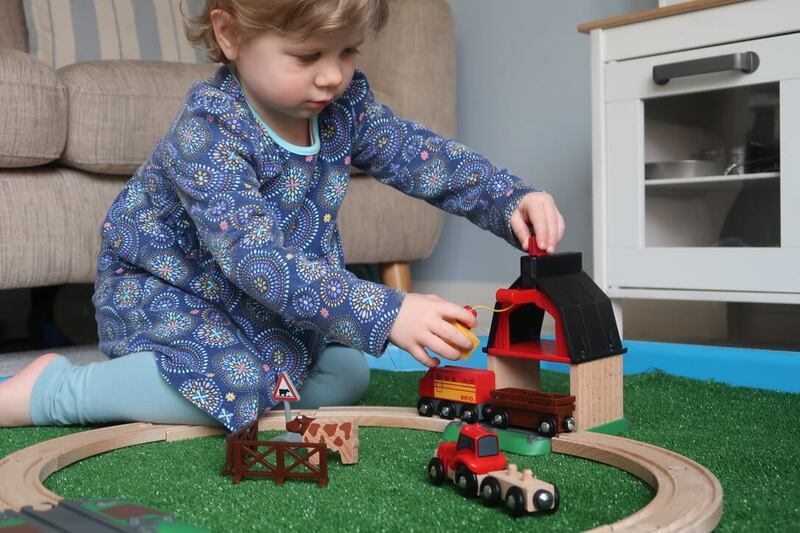 I’ve been wanting to do a train-based tuff spot for a while, so when we were sent the BRIO Farm Railway Set to review, it presented the ideal opportunity. 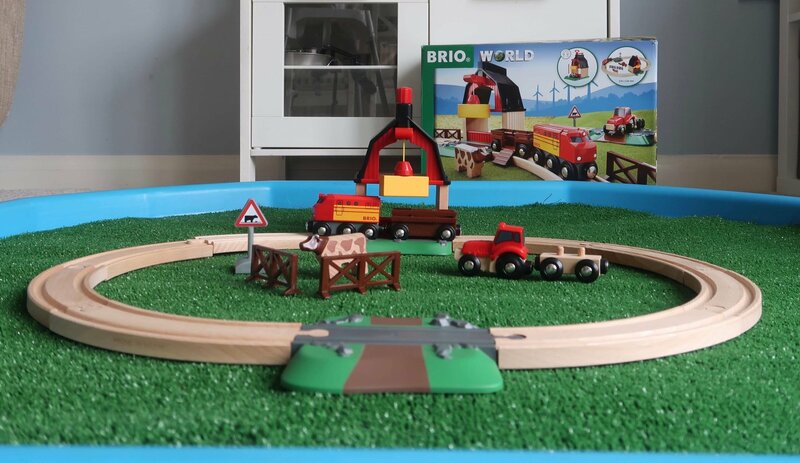 I popped our artificial grass base in the tuff spot, to recreate the Spring fields from the story, then set up the BRIO Farm Railway Set. I wanted to add some of our other farm animals and related toys as well, but M wouldn’t let me! She was quite happy playing with what came in the box. M is really into Thomas the Tank Engine at the moment, and liked it when I suggested that she might want to pretend that the train was like Thomas collecting the straw for the lambs. Mostly I think M liked investigating how the different components of the railway set worked; especially the hay loft. She spent most of her time playing, experimenting with different ways to move the hay around, using the magnet on the hay loft pulley. Personally, I think this activity could have been enhanced with more toy animals and maybe some extra hay bales in the form of Weetabix bricks, but M wasn’t having any of it!